May gave us plenty of sun (including 2 sunny bank holiday weekends (!!)) and plenty of rain (we prefer it to come more gradually though, we had more than 40mm last Tuesday) so after a slow start, the crops (and the weeds) are growing well. We have to rely on crop covers if we are to feed our customers and not just rabbits, pigeons and rooks though; although this doesn’t always work, we know the rooks are very clever but now they seem to be teaching the rabbits a thing or two! Our recent planting of PSB is covered by a crop cover, which now has lots of small holes in it where the rabbits have chewed through enough of the cover to get at the plant below – luckily still time to sow some new plants. We managed to havest a few punnets of (very small) new potatoes for markets on 9 June - more to come soon. The Gleaning Network is a charity that has list of volunteers they can call on to harvest surplus produce from farmer’s fields and a network of outlets for the food that is gleaned. We asked them to come to us at the end of May as the last of our leeks were starting to bolt and wouldn’t all get sold. 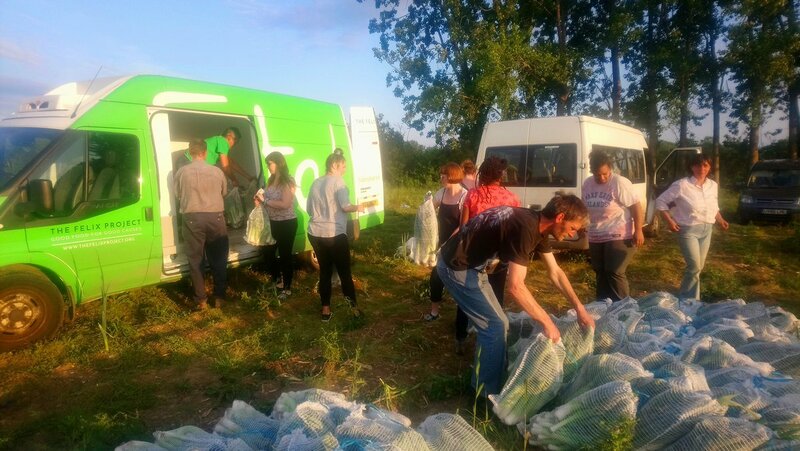 The volunteers harvested, trimmed and netted up over a tonne of leeks, which were collected by The Felix Project, and distributed to Fareshare and other charities.